One of the biggest advantages of going to school in Boston is its culture. Art is a big part of this city’s colorful history. While Boston is abound with renowned art museums such as the Museum of Fine Arts and the Isabella Stewart Gardner Museum, perhaps the best way to get a true sense of Boston’s art culture is through its murals. Here are five of the best ones Boston has to offer. Located in the picturesque Dewey Square Park, “Spaces of Hope” is a new addition to the murals on the Greenway wall. It was painted in October 2016 by Iranian artist Mehdi Ghadyanloo and many have since embraced it as a symbol of hope in the current political climate. The surreal illusionistic skyline in the mural blends into the sky itself, creating art not just on the building, but on space. Created by David Fichter with the help of the community in 1994, “The Potluck” mural is a vibrant addition to a parking lot in Cambridge’s Central Square, just through the famous Graffiti Alley. 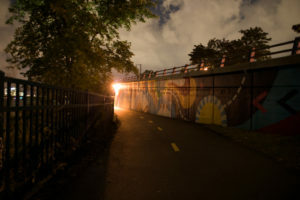 While Graffiti Alley is a continuous piece of art that passersby are encouraged to contribute to, “The Potluck” is a permanent fixture in Cambridge meant to represent the community’s diversity. In the mural, people of all colors and ethnicities gather around a feast comprised of various foods. The mural exudes joy by expressing Cambridge’s potluck: a fusion of cultures and nationalities. Painted as part of the “Pop Up! Dudley Connections” program, this mural stretches over 100 feet long and commemorates global icon Nelson Mandela after his passing in 2013. Local Boston muralists Ricardo Gomez and Thomas Burns, whose street art names are Deme5 and Kwest respectively, were selected to take on this project. Their creation represents Roxbury’s African-American community and the cause for which Nelson Mandela worked. As part of his eight-city American tour to raise money and awareness for the apartheid, Mandela passed through Boston, so this mural serves as a historic tribute as well. It certainly accomplishes the goal of the program, which is to revitalize the Boston area through art. This mural followed the opening of City Feed, a local market in Jamaica Plain. The co-owner of City Feed, Kristine Cortese, also happens to be a professional painter so this mural graces the side of the City Feed market to remind the people of Jamaica Plain to shop and live sustainably by supporting local produce. The vintage and authentic feel of the mural provides the sense of comfort that comes with fresh, local food. While this might not be the traditional wall mural, this form of community art aims to spread awareness for Boston’s dead trees. Nate Swain, a local Boston artist and muralist, decided to take on this project, painting the dead trees on Cross Street in downtown Boston. He set out to turn something dead into something beautiful. Even though most of them have since been cut down or knocked over, he said he plans on painting more dead trees around Boston within the year. This unconventional city art is not necessarily a mural, but it still spreads art and beauty throughout the city where it is much needed. The real beauty of a mural is that it is impossible to replicate. Its location and environment are part of the art form itself because it is determined by the community in which it was painted. Instead of going to one of the art museums, I suggest you take a local tour of the murals Boston has to offer and integrate yourself into the communities they embody.